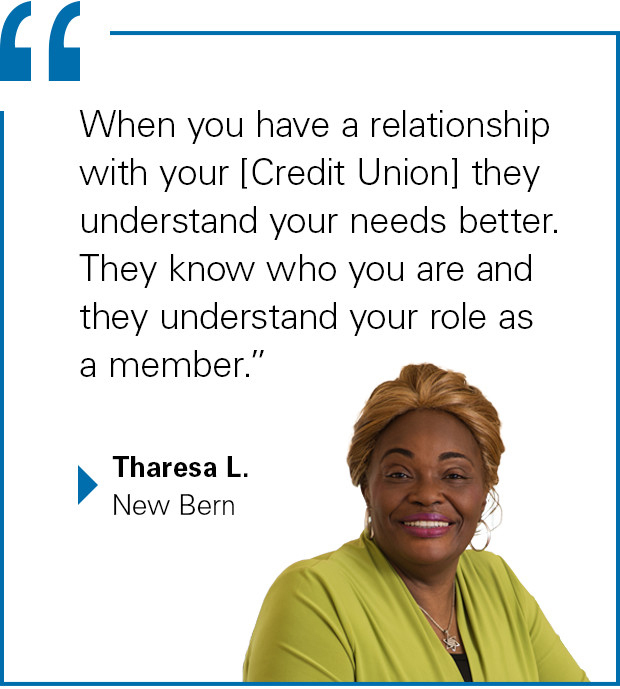 Self-governed and member-owned, credit unions offer benefits designed to help members. Though credit unions are often equated to banks, there are actually significant differences. While banks have customers and operate for profit, credit unions are not-for-profit cooperatives that offer products and services to a defined field of membership. That “field of membership” might be everyone from a certain place of employment, a church, school, community or other particular group. Credit unions are owned and governed by their members. So instead of answering to shareholders and investors, a credit union is member-focused—credit union policies and issues are decided in a way that best serves the general membership. As the cooperative grows and makes profits, those profits are passed back to members through lower loan rates, higher dividends on deposits, and expanded financial products and services. All members of a credit union own one share of the cooperative, regardless of amount invested. The cooperative is governed by a board of directors, which is made up of volunteers elected by fellow members. This self-governing attribute helps ensure that credit union policies and decision-making maintain a member focus and serve to benefit the membership at large. Voluntary membership – Credit unions are voluntary, cooperative organizations, offering services to people willing to accept the responsibilities and benefits of membership, without gender, social, racial, political or religious discrimination. Democratic – Cooperatives are democratic organizations owned and controlled by their members, one member one vote, with equal opportunity for participation in setting policies and making decisions. Economic participation – Members are the owners. As such they contribute to, and democratically control, the capital of the cooperative. This benefits members in proportion to the transactions with the cooperative rather than on the capital invested. Independence – Cooperatives are autonomous, self-help organizations controlled by their members. If the cooperative enters into agreements with other organizations or raises capital from external sources, it is done so based on terms that ensure democratic control by the member and maintains the cooperative autonomy. Education – Cooperatives provide education and training for members, elected representatives, managers and employees so they can contribute effectively to the development of the cooperative. Concern for community – While focusing on member needs, cooperatives work for the sustainable development of communities, including people of modest means, through policies developed and accepted by the members. Cooperation among cooperatives – Cooperatives serve their members most effectively and strengthen the cooperative movement by working together through local, state, regional, national and international structures. For more on how these principles are incorporated into what we do for you every day, read our story. All funds on deposit with a credit union are federally insured by the National Credit Union Administration (NCUA) for up to $250,000 and separate coverage up to $250,000 for IRAs. This level of insurance coverage is permanent. An additional layer of deposit security is added with audits—each credit union is subject to inspections from internal and external auditors. Credit unions as a whole are rooted in the advocacy of people helping people. From offering better rates that raise standards of living, all the way to lobbying for national change, credit unions tend to work diligently in the advocacy arena. We’re all in this together, whether members of a single credit union or operating as a whole because change that affects one, affects all, The best way to stay proactive is to stay knowledgeable and politically involved. One basic philosophy of credit unions is to serve their members. Part of this philosophy is volunteering. The board of directors is a volunteer board and the supervisory committee members who safeguard member assets are volunteers. Volunteerism is a key component of all credit unions. It is because of the assistance of dedicated individuals who give their time and energy that the credit union movement has propelled forward and become what it is today. Share: an amount required for deposit to join a credit union; this amount also represents ownership. Each member receives one share of credit union ownership when they join. Dividend: Any declared or prospective earnings on a member's shares in a credit union to be paid to a member's account. Member: an individual who maintains his share in the credit union. Each member has voting privileges and all members are equal. Field of Membership: the defined area from which members can join. This area might be a particular profession, place of employment, church, community, etc. The field itself is defined, but membership is all-inclusive within that field. NCUA (National Credit Union Administration): A federal agency that oversees the regulation of federal credit unions. Want to know about the benefits of LGFCU membership?